Joshua Lockwood was born in Ossett in early 1866, the second child, and first son of ten children born to Mark Lockwood and Elizabeth (nee Clay). Mark Lockwood was a 26 year-old widower when he married 21 year-old spinster Elizabeth Clay at Dewsbury All Saints on the 14th September 1862. He married his first wife Hannah (nee Harrop) at Dewsbury All Saints Parish Church on the 24th December 1854 and they had one child, Harrop Lockwood born 1858. Hannah Lockwood died in November 1860, and she was buried at South Ossett Christ Church on the 28th November 1860, aged only 24 years. In 1871 and 1881 Joshua and Elizabeth Lockwood were living at Little Town End, Ossett, latterly with eleven children, four daughters and seven sons, including Harrop Lockwood. Joshua was a joiner and builder, employing three men and two boys. Joshua, aged 15 in 1881, was a rag grinder. At Ossett Holy Trinity Church in December 1890, Joshua Lockwood married Northamptonshire-born Nellie Jane Wright and they were to live at Ryecroft Street, Ossett. Like his father, Joshua was working as a joiner. By 1901 the couple had moved to the top of Church Street, Ossett and were living there with their adopted daughter, Shoreditch-born, Mary Ellen Lovatt, aged 9. Joshua was now working as a a cloth waste dealer. By 1911 Joshua, Nellie and Mary Ellen Lockwood had moved to a six-roomed home at 20, Springstone Avenue, Ossett. Joshua was now 45 years of age and operating two businesses; as a wool and cloth waste merchant and also a coal agent. His adopted daughter had now taken her adoptive parents' name and was known as Mary Ellen Lockwood. She was working as an assistant teacher at an elementary school. Joshua's father, Mark Lockwood, a farmer and joiner, died on the 13th August 1898 and probate of his estate was granted at Wakefield on on the 6th June to his sons, Joshua, a waste dealer, George Lockwood, joiner and builder and Oliver Lockwood grocer’s assistant. His effects were £1,142 8s 7d. Joshua Lockwood's adopted daughter, Mary Ellen Lovatt Lockwood married Arthur Goodyear Simpson in September 1914 in the Dewsbury area. It is not certain that there were children born to the couple. Joshua Lockwood’s army service record appears not to have survived, and it is not known if he was awarded any medal to acknowledge his service. As a commissioned officer, the Commonwealth War Graves Commission record does not include his service number. His "Ossett Observer" obituary records that he embarked for France in January 1916, but, in fact, it was actually January 1917 when the 2nd/4th Battalion, KOYLI landed in France. He would not have qualified for the 1914/15 Star, which required service overseas before the 31st December 1915. He would however have been entitled to the award of the British and Victory medals. During WW1, Joshua Lockwood served briefly with 1/4 KOYLI and then he transferred to 2/4 KOYLI after being commissioned as a Lieutenant upon the battalion's formation. The Territorial 2nd/4th Battalion, KOYLI was formed at Wakefield on the 30th September 1914 as a second line unit. On the 1st March 1915 they moved to Bulwell and were attached to 187th Brigade in 62nd (2nd West Riding) Division. They moved in April 1915 to Strensall and in May to Beverley, going on in November to Gateshead, in January 1916 to Larkhill and in June 1916 to Flixton Park near Bungay. They moved again in October 1916 to Wellingborough and landed at Le Havre, France on the 15th January 1917. The 3/4th, 3/5th and 3/6th Battalions of the Devonshire Regiment were formed at Exeter, Plymouth and Barnstaple respectively on the 25th March 1915. They moved to Bournemouth in August 1915 and on the 8th April 1916 they became Reserve Battalions. The 3rd/4th then absorbed the 3rd/5th and 3rd/6th battalions on the 1st September 1916 at Hursley Park near Winchester. The new 3rd/4th Reserve Battalion remained in England (moving to Bournemouth in October 1916, Sutton Veny in March 1917 and Larkhill in early 1918), until going to Ireland in April 1918. Thereafter they were stationed at various times at Belfast, Londonderry and Clonmany. Joshua Lockwood of 20, Springstone Avenue, Ossett, quartermaster and honorary captain in the King’s Own Yorkshire Light Infantry died on the 16th December 1918 at the Officer’s Hospital, Holywood, County Down, Ireland. Probate was granted at Wakefield on the 14th April 1919 to Nellie Jane Lockwood, widow. His effects were £2141 1s 11d. Joshua Lockwood's widow, Nellie Jane Lockwood, then of Osmunde Hill, Orpington, Kent, widow, died on 17th December 1948; thirty years and one day after her husband’s death. She was 80 years of age. Probate was granted at Wakefield to their adopted daughter May Ellen Lovatt Simpson (wife of Arthur Goodyear Simpson). Her effects were £8,819 4s 11d. Mary Ellen Lovatt Simpson (nee Lockwood) died in Camberwell, London in December 1966. "Death Of Captain Joshua Lockwood Of Ossett - A Popular Territorial - We regret to announce the death, which took place at a military officer's hospital at Holywood, Co. Down, Ireland, on Monday, of Captain and Quartermaster Joshua Lockwood, who latterly has been attached to the 4th Reserve Battalion, Devon Regiment and formerly of the King's Own Yorkshire Light Infantry (Territorials), whose home was in Springstone-avenue, Ossett. A well-known and respected townsman, the deceased, who from his youth has been an enthusiast in the Volunteer movement, was in business in civil life until the outbreak of the war, when, as a non-commissioned officer of the local Territorials, he was mobilised for active service with the Ossett and Horbury detachment of the 1st Battalion of K.O.Y.L.I., while they were undergoing their annual training in camp at Whitby. Three or four months afterwards, when a second battalion of the regiment (n.b. 2/4 KOYLI) was formed in the neighbourhood, the deceased was transferred to it and took the commissioned rank of lieutenant. With this battalion he proceeded to France in January 1916, but after eighteen months service he was invalided home suffering from pneumonia and bronchitis. On recuperating, he was passed for home service only, and in July this year went to Ireland, where he was attached to the 4th Reserve Devon Regiment, then stationed at Chonmaney, and afterwards at Randlestown, Co. Antrim. It was during his stay here that he became ill, suffering from gastritis, and after treatment in hospital at Belfast went to Holywood. On Saturday he had an apoplectic seizure. His wife, who was at home, was telegraphed for, and accompanied by Mr. Knight, brother-in-law, at once proceeded to Ireland, where they found the deceased in a dying condition, but conscious. Death occurred on Monday morning. Deceased was 52 years of age, and leaves a widow and adopted daughter. His connection with the Volunteer and Territorial movements extended over a continuous period of about 35 years, during many of which he was very popular as a quartermaster-sergeant. A clever marksman, he was a 'crack-shot' of the district, and for years carried off some of the principal prizes, awarded for the highest scores, at the annual shooting competitions at Strensall, of the Yorkshire Rifle Association (of which he had been executive officer), and also one of the local Volunteers. He was also a frequent competitor at Bisley, where he won many prizes. His energies also extended in other directions. As an ardent Churchman, he had a long, active association with Holy Trinity Parish Church and Schools, For over a quarter of a century a Sunday school teacher, at the time of his death he was a superintendant of the Sunday school, though his military duties since the beginning of the war have prevented him from officiating, and he has been a churchwarden, one of the original members of the church council, and its first secretary, and a holder of other important parochial offices. In connection with various other organisations in the borough, the deceased will be much missed. The funeral took place yesterday (Friday) afternoon at Holy Trinity Churchyard and was accorded military honours. It was largely attended. The coffin, which was covered by the Union Jack, was conveyed from his home to the churchyard on a bier, and the cortege included an officer and about fifty soldiers from Pontefract, who furnished a firing party, and buglers. In addition to the family mourners, there was a large number of personal friends, including several military officers and former associates of the Volunteer force, fellow church and Sunday school workers, members of the Ossett Conservative Club, and others. The body was met at the church gates by the Rev. R. E. Burlingham, (vicar) who conducted the burial service, and the churchwardens and sidesmen, and after the coffin had been committed to the grave soldiers fired three volleys over it, and buglers sounded the 'Last Post'. Wreathes were sent by the following: Mrs. J. Lockwood, Mr. and Mrs. A.G. Simpson, Miss Emily Lockwood, Mr. and Mrs. D. Broadhead, Mr. and Mrs. H. Ellis, Mr. A.E. Knight, Mr. and Mrs. Walter Lockwood, Mr. and Mrs. Harold Fawcett, Mr. and Mrs. Mark Lockwood, Major Walker, Colonel Hind, and remaining officers, 1/4 KOYLI, Lieutenant-Colonel H.R. Ratcliffe and Officers, 4th Reserve Battalion, Devon Regiment, President (Earl of Zetland), Council and Members, Yorkshire Rifle Association, Ossett Parish Church Council, Ossett Parish Church Sunday School Teachers, Ossett Conservative Club, Sergeant-Major and Mrs. Lingwood, Mr. and Mrs. T. Moss and Mrs. Spencer, Councillor and Mrs. Hodgson and Family, A.J. Russell and Sons, Maidstone, Mr. and Mrs. Arthur Shaw, Mr. and Mrs. Leonard Shaw." "It is with the deepest regret that we heard of the death of Captain J. Lockwood, which took place on December 16th. He had been on active service since the beginning of the war, and when invalided home from France this summer was not really fit for the hard work to which he was sent in Ireland, where he died. It is over thirty-five years since he joined the Volunteers, and he was with them in Camp when war broke out. We shall miss him greatly at the Church, in which he had been an official, and the keenest of workers, being one of the founders of the Church Council and its first secretary. He was one of the pioneers of the Parochial Fund movement, and was one of its Treasurers. Those who worked with him and under him as their Superintendant know how he threw his whole heart and soul into his Sunday School work, with unfailing regularity and a jealous care for the interests of the children. Joshua Lockwood was a splendid type of manly and devoted Church worker, and his memory should inspire many of our young men to follow his example." 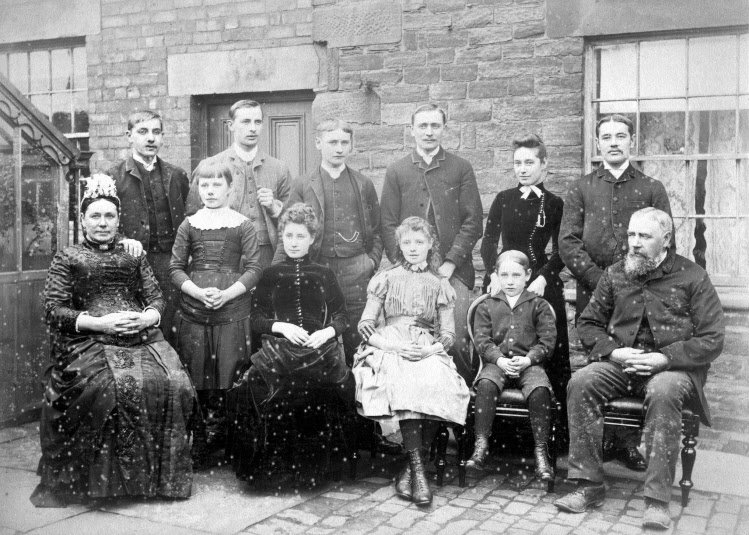 Above: The family of Mark Lockwood at their home in Little Townend, Ossett in the mid 1880s. Joshua Lockwood is thought to be standing at the far right, immediately behind his father Mark Lockwood. 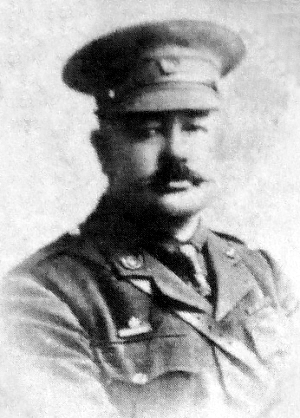 Captain Joshua Lockwood, aged 52 years, son of Mark and Elizabeth Lockwood, of Ossett, died on the 16th December 1918. He is buried at grave reference 8. 54. at the Ossett (Holy Trinity) Churchyard, 2 Church Street, Ossett.